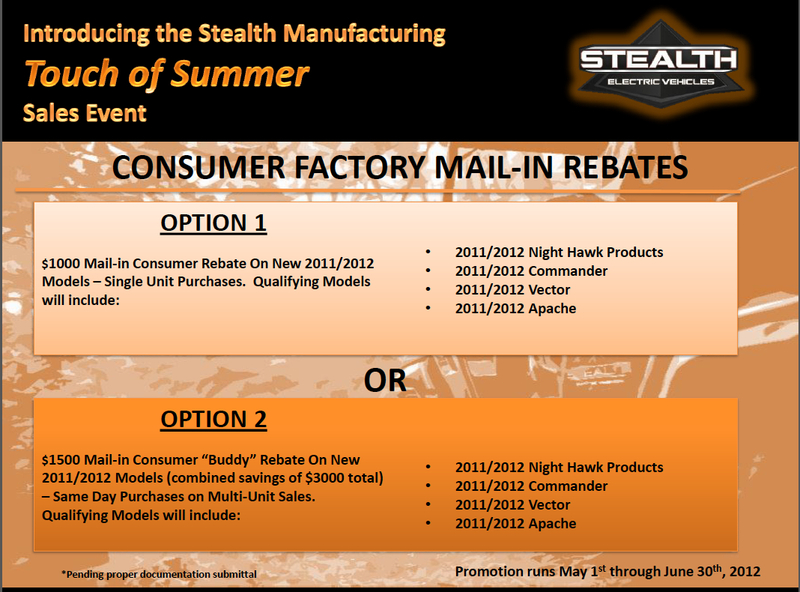 Stealth Manufacturing has just announced a “Touch of Summer” rebate program on all Night Hawk products. Individuals who purchase a Night Hawk vehicle (all electric or hybrid) between May 1st and June 30th, 2012 will be eligible for a $1,000 mail-in rebate. The only requirements are that the vehicle be purchased from Dealer inventory during the two month period, that the vehicle is registered for warranty, and, a completed mail-in rebate form is completed and returned to Stealth with a copy of a bill of sale or paid dealer invoice. Contact your dealer for exact program details. If you have a friend who is considering a Stealth purchase, there is an even better deal. If you and your friend buy on the same day and both register and send in your rebate forms with bills of sale or paid dealer invoice, you will each receive a $1,500 rebate. That’s right $1,500 each. Don’t miss this opportunity. If you have questions, contact your West Coast dealers at Smith Golf Cars in Rohnert Park, California (800-445-5526) or Stealth Northwest/Cart-Away in McMinnville, Oregon (800-909-9809). This entry was posted in Uncategorized and tagged Bad Boy Buggy, John Deere Gator, Kawasaki Mule, Ranger EV, Rebate. Bookmark the permalink.